The power mode must be in ACCESSORY or ON to use HFL. 2. Rotate to select Phone Settings, then press . 2. Press the MENU button to display the menu items. - If your phone still does not appear, move to select Phone not Found? and search for Bluetooth devices using your phone. From your phone, select HandsFreeLink. • Your phone’s battery may drain faster when it is connected to HFL. - Repeat the procedure to select Connect Phone, then Add Bluetooth Device. 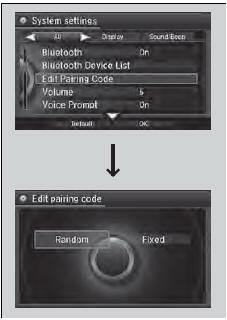 - Repeat the procedure to select Edit Pairing Code. 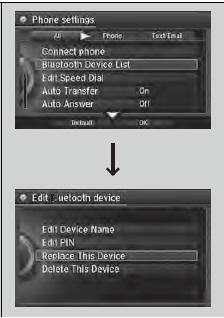 - Repeat the procedure to select Bluetooth Device List. 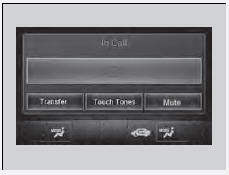 The replaced phone will keep the same speed dial entries, and security PIN information from the previously paired phone. 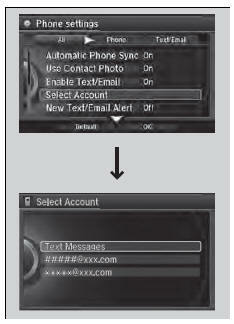 - Repeat the procedure to select New Text/Email Alert. 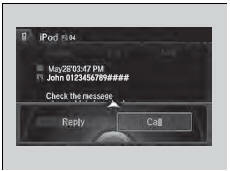 On: A pop-up notification comes on every time you receive a new text message. 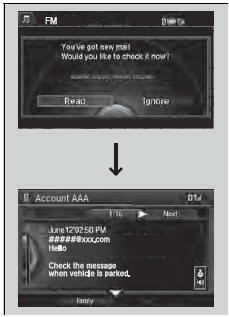 - Repeat the procedure to select Message Auto Reading. 3. Rotate to select On, Off or Auto, then press . Move to delete. Rotate t o select OK to enter the security PIN. You can also enter a number using 6. Re-enter the four-digit number. Edit the user name of a paired phone as follows: 1. Press the SETTINGS button. 3. Rotate to select a phone you want to edit, then press . 4. Rotate to select Edit Device Name, then press . 5. Enter a new name of the phone. Move to delete. Rotate or move to select OK then press to enter the name. You can also enter a name using the icons. To store a speed dial number: 1. Press the PHONE button. 3. 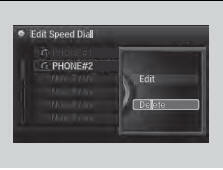 Rotate to select Speed Dial, then press . 4. Rotate to select a place to choose a number from, then press . 5. 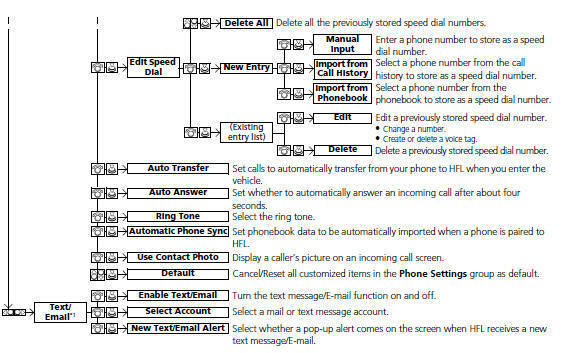 When the speed dial is successfully stored from Import from Call History or Import from Phonebook, you are asked to create a voice tag for the number. Rotate to select Yes or No, then press . 6. Using the button, follow the prompts to store a voice tag for the speed dial entry. 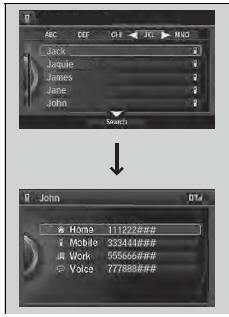 Add phonetic modifications or a new voice tag to the phone’s contact name so that it is easier for HFL to recognize voice commands. 3. Rotate to select Phonebook Phonetic Modification, then press . 4. 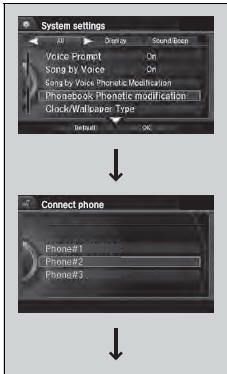 Rotate to select the phone you want to add phonetic modification to, then press . You can store up to 20 phonetic modification items. 5. 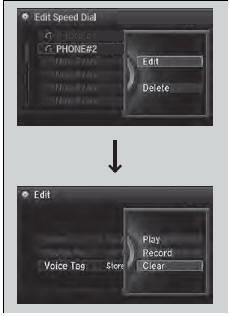 Rotate to select New Voice Tag, then press . 6. 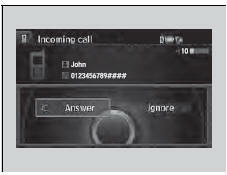 Move or and rotate to select a contact name, then press . 7. Rotate to select Modify, then press . 8. Using the button, follow the prompts to complete the voice tag. 9. You will receive a confirmation message on the screen. Rotate to select OK, then press . 5. Rotate to select a contact name you want to modify, then press . 6. Rotate to select Modify, then press . 7. Using the button, follow the prompts to complete the voice tag. 8. You will receive a confirmation message on the screen. Rotate to select OK, then press . 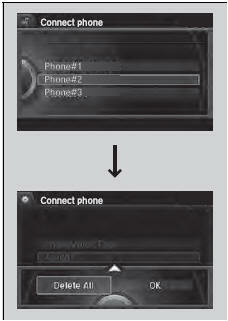 You can only modify or delete contact names for the currently connected phone. 4. 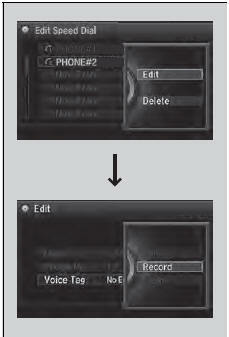 Rotate to select the phone you want to delete phonetic modification, then press . 5. Rotate to select a contact name you want to delete, then press . 7. Move and rotate to select OK, then press . - The contact name list appears. 5. 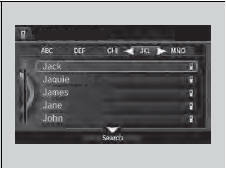 Move and rotate to select Delete All, then press . 6. You will receive a confirmation message on the screen. Rotate to select Yes, then press . Press the button and say “Call” and the voice tag name, “Call by name” and the phonebook name, or “Call” and the phone number. 3. Rotate to select Phonebook, then press . 4. The phonebook is stored alphabetically. - You can use the keyboard on the touch screen for an alphabetical search. You can use the keyboard on the On Demand Multi- Use DisplayTM for an alphabetical search. 3. Rotate to select Dial, then press . 5. Rotate to select , then press . 3. Rotate to select Redial, then press . You can use the keyboard on the On Demand Multi- Use DisplayTM to input numbers. 3. 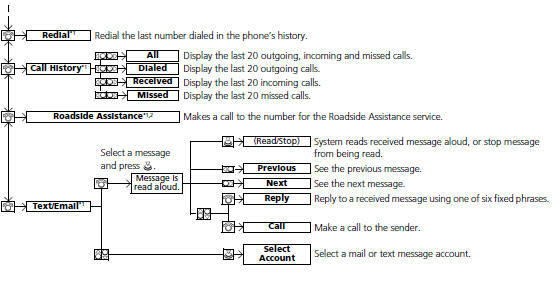 Rotate to select Call History, then press . 4. Move or to select All, Dialed, Received, and Missed. 2. 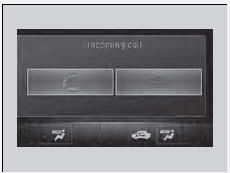 Move the left selector wheel right to select Call History. 3. Roll the left selector wheel to select a number. 4. Push the left selector wheel or the button. (Appears only when a phone is connected to HFL.) 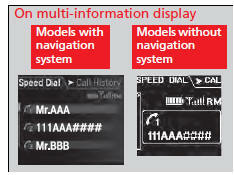 These icons next to the number indicate the following: : Dialed calls. 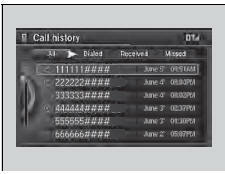 The call history displays the last 12 dialed, received, or missed calls. 2. Move the left selector wheel left to select Speed Dial. Move to select More Speed Dials to view another paired phone’s speed dial list. You can make a call from that list using the currently connected phone. 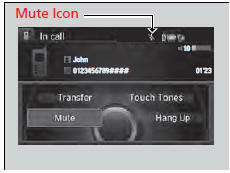 Any voice-tagged speed dial entry, phonebook name or number can be dialed by voice from any screen. 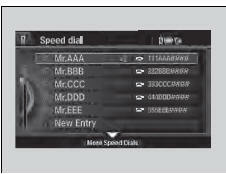 The speed dial displays the 20 speed dial entries. You can select the icons on the On Demand Multi- Use DisplayTM instead of the and buttons. 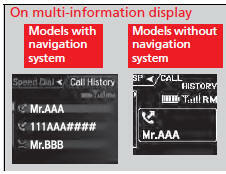 The available options are shown on the Phone screen. - The mute icon appears when Mute is selected. Select Mute again to turn it off. 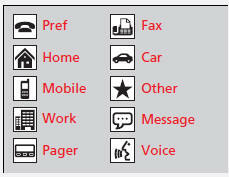 You can select the icons on the On Demand Multi- Use DisplayTM. 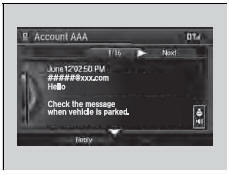 HFL can display newly received text messages and E-mails as well as 20 of the most recently received messages on a linked cell phone. 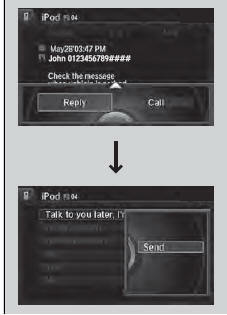 Each received message can be read aloud and replied to using a fixed common phrase. 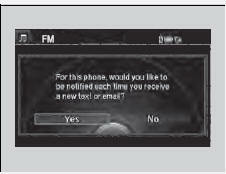 When you receive a text message or E-mail for the first time since the phone is paired to HFL, you are asked to turn the New Text/Email Alert setting to On. 3. 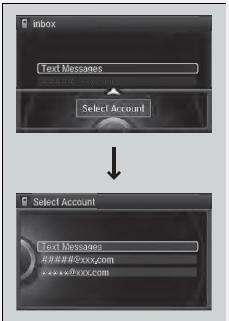 Rotate to select Text Messages or an E-mail account you want, then press . Move to select Select Account, then press . 3. Rotate to select Text/Email, then press . 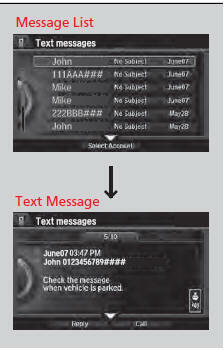 To see the previous or next message, move or on the text message screen. 4. Rotate to select a folder, then press . 5. 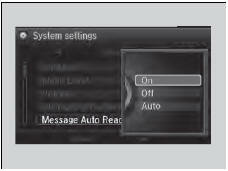 Rotate to select a message, then press . 2. Press to stop reading. Press again to start reading the message from the beginning. 2. Move and rotate to select Reply, then press . 3. Rotate to select the reply message, then press . 4. Select Send to send the message. - Message sent appears on the screen when the reply message was successfully sent. 2. Move and rotate to select Call, then press . Provides a nationwide service for unexpected incidents. 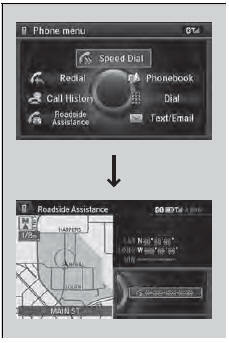 You can call for assistance using a phone paired and connected to Bluetooth® HandsFreeLink®. 1. 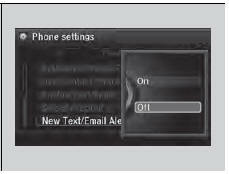 From the Phone screen, press the MENU button. 2. Rotate to select Roadside Assistance, then press . 3. Rotate to select a phone number, then press . If you are subscribed to a paid AcuraLink package, you can call the roadside assistance using the LINK button instead of your phone.